In this short article we present the work of Muberra Bulbul, a talented mixed-media artist from Turkey. While looking for artist calls on the Internet, I noticed this project and checked it out. I was excited by the fact that artists from different countries were asked to contribute their personal interpretation in a common subject. We have many superstitious beliefs in our own society (Turkey). We have been growing up with superstitions as part of our culture, since childhood. The whistling belief is well known. I was impressed by this, as a project. Before starting, I did a research on mythology and superstition beliefs. I used mythological symbols in my works. I tried to experiment with the theme. Sometimes I was nervous about it and I was nervous about what was going to happen. Working on such a project gave me the opportunity to go over my fears. The more I whistled in my head, the more I added to my works. I tried to feel the psychology of those who have superstitious beliefs. I transferred their mood, behavior and thinking patterns to my works. 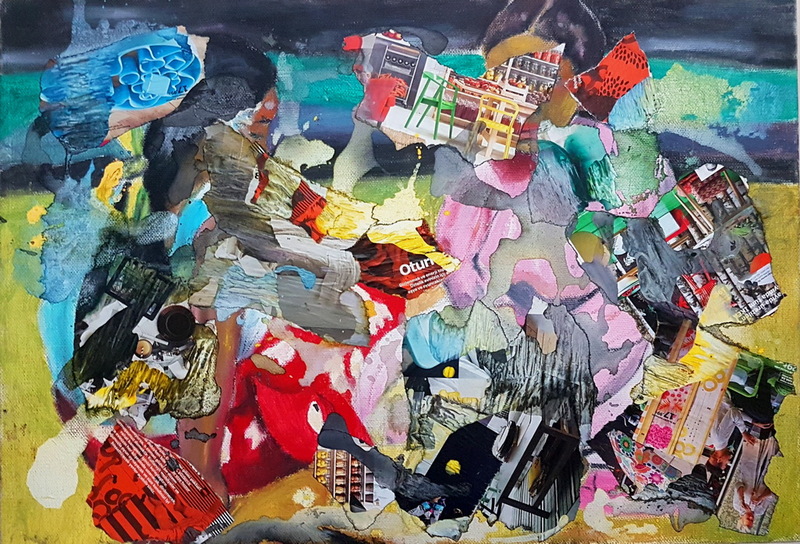 I have been doing collage and mixed-media studies in recent years. I am trying to combine past life experiences or beliefs with todays' technology. Myths and legends have always been of interest to me and I have reflected on it, in my art. Inspired by an event or a thought, I try to express feelings. I worked more focused on this project and tried to portrait superstition as part of many societies. Transition from individual to general. I used to believe in superstition. But the education and knowledge I received in my adult years has expanded my field of view. While I say I don't believe, I often catch myself remembering stories I used to hear as a child but I return to reason quite fast! When people look at my works, I want to see their subconscious influenced. I want them to feel the fear and the tension. I expect them to face the dark side and their selves. I want them to search for their inner darkness and think about why they create it. The idea of bringing together people with diverse culture, race, religion, language and geography in a common story, that is familiar to everyone, is great! It is possible to reflect our own cognitive and subconscious approach and our cultural view. It is very interesting that a single story is told by artists coming from other countries to express their own methods of expression. Taking part in such a project is exciting and inspiring. Everyone will find something of interest. This project can never be a stranger to people. People should approach this event with their own feelings, thoughts, perception and subconscious. Also attending this exhibition, everyone will become a part of this collective process. We all have fears and concerns. I have created works by combining my individual and social fears. Whistling at night in my country, especially when being at home means to call the dead! The children grew up with this fear. No whistles go through the cemetery. Evil spirits can wake up. I tried to explain these fears using colors and patterns. I want to turn the negative into positive. Visual arts feeds your eyes, your soul and your mind. It is a tool in the hands of human race used for personal revelation. It provides interaction between people. It excites or annoys us. It enlightens us. I like to observe and dream. I'm evaluating things with my senses and feelings. I love stories and legends very much. I can make up stories. I express myself better by painting and I find peace in that. I love everything visual around me. All the works created for WHISTLE project by Muberra, will be available to the public during the transmedia exhibition. Muberra Bulbul was born in Istanbul/Turkey, she graduated from the Painting Department of the Fine Arts Department at Marmara University and received her master's degree in Graphic Design. She is doing her PhD in Yildiz Technical University, Institute of Social Sciences, Art and Design Department and Istanbul Arel University in Graphic Design. During this period, she held two personal painting exhibitions, participated in many national and international group exhibitions and participated in symposiums and workshops. She is currently working as a lecturer at a private university in Istanbul and working as a Visual Arts Teacher at Ministry of Education. Since her high school years, she has made various press, advertising, graphic-web designs and continues her painting works actively. The artist uses mythological characters as a symbolic language in her works. Although myths from the past to the present day vary from society to society, they continue in the same way in different cultures and beliefs. The artist has established a connection between past and present and has placed these legends with various archetypes in her works. In her many works she has done canvas works with collage and mixed technique. Recently, she has been writing articles on the development of technology and the importance of artificial intelligence in art and producing works on this subject.